While I am tremendously aware that good interior design is hard to come by, I still find it a bit depressing to find so few good examples of it in coffeehouses. Sure, other things factor in (location, economy, etc) but with so many resources out there for the design-challenged (like IKEA and blogs like Apartment Therapy to start), it just seems so wrong to sit in a boring white wall cafe adorned with Walmart art and coffee puns. But recently I stumbled upon a swanky coffee pad in Rochester called Boulder Coffee Company. 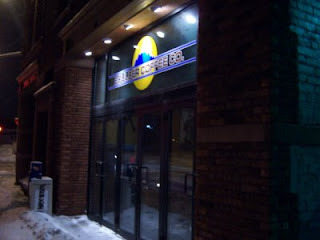 The place sits in the downtown area of Rochester in a rather large brick building. The inside opens up into a beautiful facility with high ceilings, candle-lit tables,vintage furniture, a ceramic-tiled stage for performers and a beautiful collection of eclectic art. And judging by the website and nice stage, it seems that a lot of local talent go through their doors. They roast their own coffee and seem to have a fair amount of offerings. I had the Boulder Blend, a fair coffee with hints of honey but with strong shades of char, not to mention a little stale; can't say I was thrilled with it. The espresso actually proved slightly unique in a good way; the shots were pulled long and the closest thing I can pin the taste to is like chocolate milk with a nice acidity and only a hint of char. Besides the coffee and tea (the tea I forgot to note), they also serve wine, beer and a full food menu. While I can skim little from the actual intended coffee practices from the website, I feel that Boulder seems on the right path. I definitely would like to give Boulder another try the next time I'm in town. If you're nearby and looking for decent coffee and a beautiful place to sit, give one of Boulder's locations a try. It is quite the eclectic little place - they have a tiny bakery below their coffee shop - the pastries at Krankies are baked fresh each day. Yummy! Weird, I used to work at Krankies, good to hear there are people out there buzzing about it.